A unique stunning outdoor teak garden set crafted of beautiful reclaimed teak wood and robust grade 304 brushed stainless steel. The Zenna set combines vintage style with high quality modern touches for a linear design. 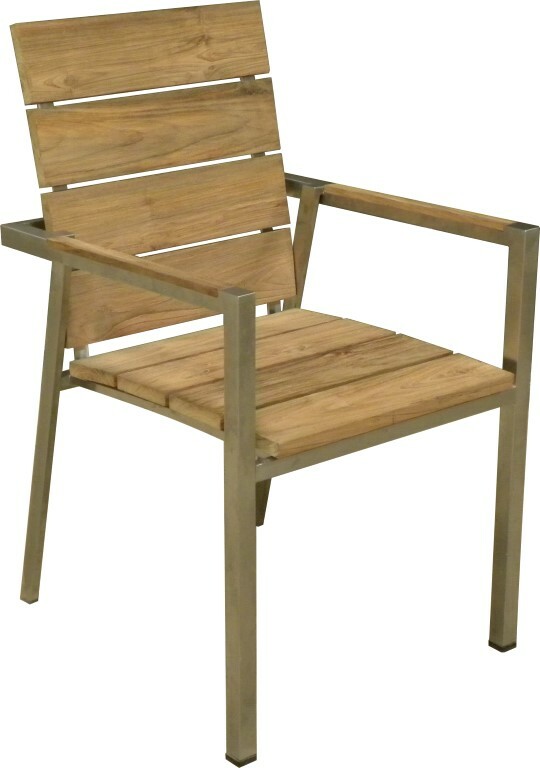 Our rediscovered teak is claimed from disused bridges and buildings so is 100% environmentally friendly. Each piece of timber is full of history and individuality with no two pieces alike. The Zenna table has an extension mechanism which fits discreetly within the table and allows the table to extend from 210cm to an enormous 310cm table which can easily seat 12. When the table is in its compacted position there are minimal visual signs of the extension leaf so the beauty of the table remains undisturbed. The table is coordinated with 10 matching stacking armchairs which sit under the table neatly. Made of reclaimed thick planks of timber and grade 304 stainless steel the chairs are perfectly harmonised.